Yoeurn now puts his strength into fertilizing and watering his organic garden instead of climbing mountains for illegal logging. “Before FH Cambodia started working in my village I worked as a labourer. Sometimes I climbed up the mountain to cut Kra Nhoung—one of the best quality of tree—for selling. That caused too many risks to my life and is an illegal practice. I did not think about preparing home gardening behind my house and kept my land free for a long time. In addition, I rarely attended village meetings. “My family did not understand about home gardening, health, and why the environment has to be protected. We did not know about the negative impact to our health of eating food with chemicals on it. My family always got sick and spent a lot of money for medical treatment. At the same time, we spent money to buy vegetables every day. 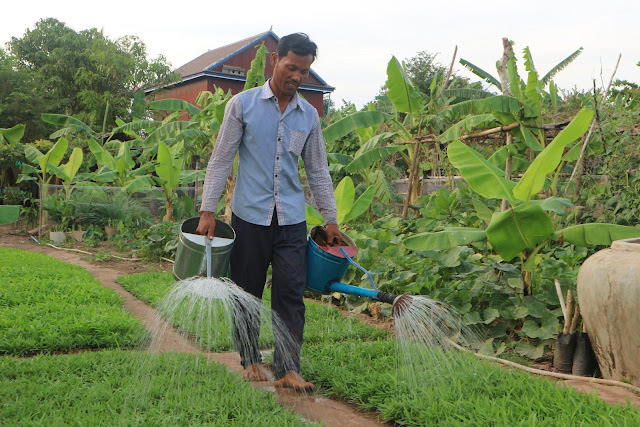 “In 2016, FH Cambodia began working with my village. After that, FH conducted meetings to select local leaders. During that time I joined the meetings and I was voted to be a Leader Farmer. “I was happy and committed to try my best to help my community and my family to change in agriculture techniques. I always joined the FH meetings; before I rarely joined community meetings with others in the village. After I became a Leader Farmer I was trained on leadership, agriculture, and home gardening. I learned compost (dry and liquid) making, natural pesticide making, land preparation, and growing diversified vegetables. FH staff always came to visit my family and encourage us to do home garden behind my house. “So I applied these techniques in my own backyard. I do home gardening behind my house around 1000 square metres of land. I grow a lot of vegetables of many kinds and collect them every day for eating and selling. I get daily income from them to support my daughter’s studying and family treatment. "I do not need to climb up the mountain to cut Kra Nhoung, that is the illegal activity. I have more time to live with my family and to train to my neighbours in gardening. I practice and first test the techniques in my own backyard; then it will be easy for me to teach my neighbours. “I am friendlier now and have more courage than before. I have built my confidence and am committed to being a good model family in the village. “In the future, I want to see my community gain more knowledge on agriculture techniques, have enough organic vegetables to eat, understand health, hygiene and sanitation, and educate their children. I also want to see my community stop migration to neighbouring countries illegally to work and climb up the mountain to cut Kra Nhoung. I hope that other members of my community will actively participate in development activities like savings groups, animal raising, and crop growing. I hope that my village will be developed on agriculture and each family will be healthy. Moreover, I want to see my community unite as a strong force and help each other. “Before I started with FH my family and I did not concern ourselves with growing vegetables, raising animals, or our health. But after I got involved, I noted that my family and myself are changing. We take care of our health and I really value my daughter’s education, now. I am very happy that I became a part of this and see a lot of change in my village. Support a farmer like Yoem Yeourn by giving a Garden Pack today. (from the right) Yoeurn, his wife Sok Sophon, their daughter, Yoeurn's brother. Yoeurn's brother helps water their thriving garden.